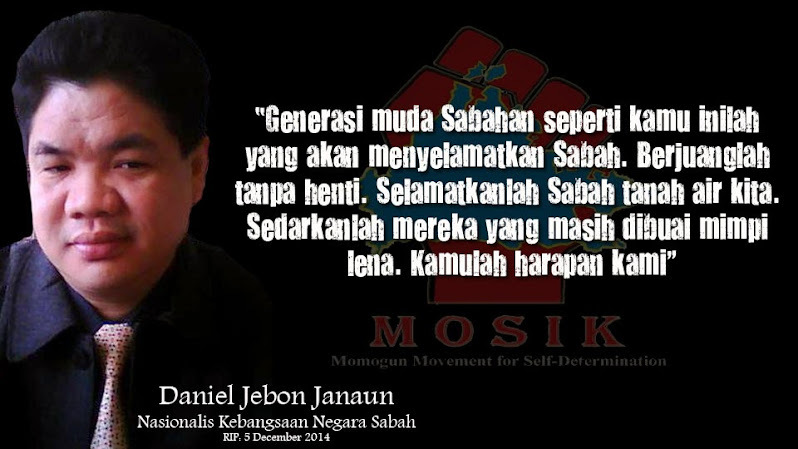 As already stated, the Twenty Points Memorandum came into being when five political parties representing the people of Sabah presented a united stand on the minimum safeguards considered by the Sabahan leaders as crucial, the acceptance of which would pave the way for the formation of the new Federation. This document is truly important because it embodies the needs and aspirations of the people of Sabah. 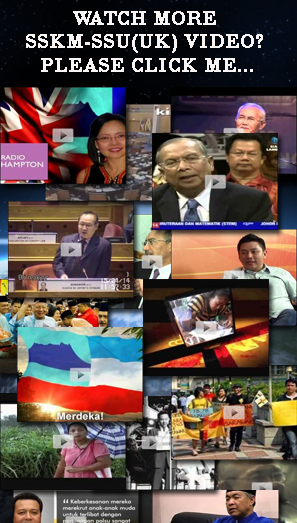 The views expressed in the Twenty Points were the basis of Sabah’s acceptance to be part of the Federation of Malaysia. Most of the Twenty Points were incorporated upon deliberation, into the Inter-Governmental Committee Report and the Malaysia Agreement. It should be stressed here that while much energies and time were expended in deliberations on the constitutional safeguards, the mechanism for their implementation and protection from change, amendment or deviation was conveniently disregarded. 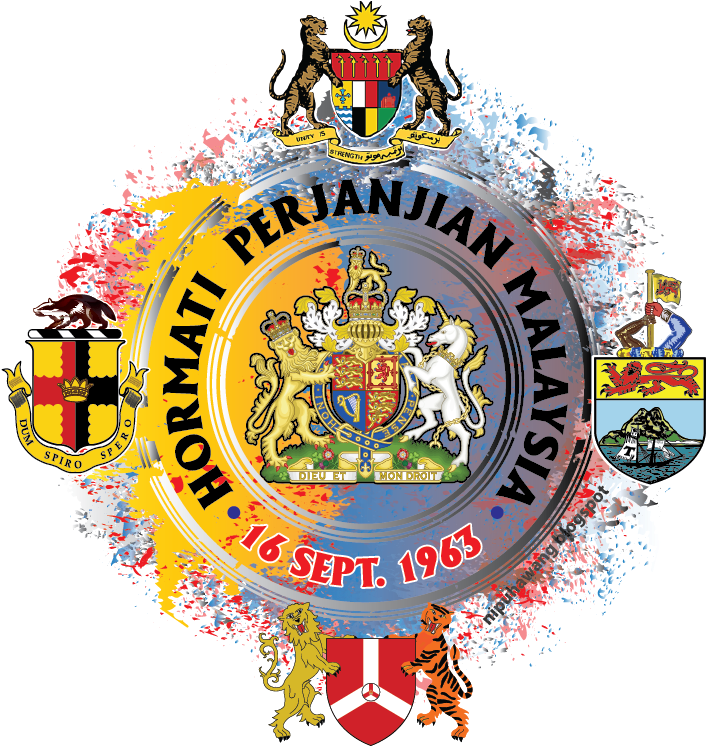 Hence, with a powerful and all-embracing Malayan Government, insufficient attention was paid by the Sabah negotiating team as to how the assurances, undertaking and promises could be implemented once Sabah became a component of the Federation of Malaysia. Little attention was also paid to the subject of recourse which Sabah might take against the Federal government in the event of breach of the constitutional safeguards and assurances. The safeguards were negotiated in the spirit of a gentlemen’s agreement. 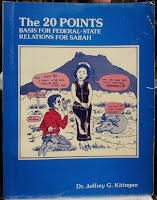 It can be inferred that the absence of any provision in the 20 Points for a possible recourse which Sabah could take against the Federal government in the event of a breach of the constitutional safeguards and conditions was indicative more of the faith of Sabah’s leaders in former Prime Minister, Tunku Abdul Rahman and the Federal government’s assurances rather than the lack of foresight. 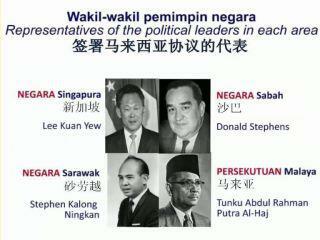 To them a gentlemen’s agreement was sufficient guarantee, although later events have proven Sabah’s leaders wrong. The Twenty Points are presented below together with a statement of their status in the context of the IGC, Malaysia Agreement and Federal Constitution. Comments pertaining to deviations in implementation, where appropriate, are outlined after the presentation of each point. 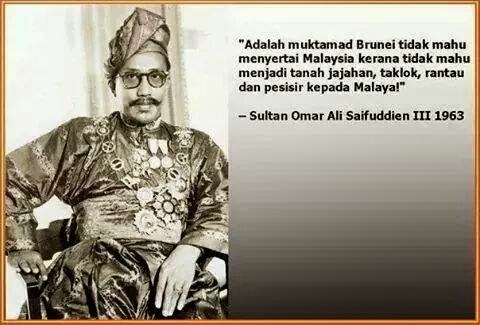 While there was no objection to Islam being the national religion of Malaysia there should be no State religion in North Borneo, and the provision relating to Islam in the present Constitution of Malaya should not apply in North Borneo. In the IGC Report this point was taken up in the form of the provision that “Islam is the religion of the Federation” which essentially reaffirmed Article 3(1) of the Federal Constitution. A contravention of this point occurred when the former Chief Minister of Sabah, Tun Mustapha enabled the passage of a constitutional amendment in the State Constitution thereby making Islam the State religion in 1973. It is well-known that Tun Mustapha actively discriminated against the promotion of other religions by expelling their missionaries. By this act, religious freedom which was intended by this point was abrogated in favour of Islam. His successor, Datuk Harris Salleh, also actively engaged in proselytization by using Islam as an instrument to grant favours to new converts. It was widely perceived by the general public that the actions of both Tun Mustapha and Datuk Harris were motivated by their need to strengthen their own political position vis-à-vis Kuala Lumpur. Today, the status of Islam as the State religion has made it an instrument of political bigotry and provides a justification for religious polarisation and discrimination. One may, of course, argue that the deviation that has occurred with respect to this particular point was caused by the State and not by the Federal authorities. This is too simplistic a view. 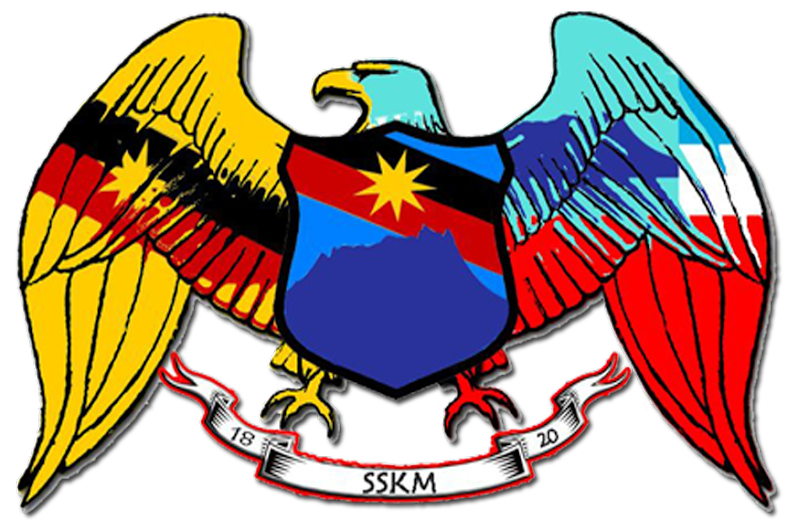 As will be shown in Section V of the Memo, an examination of the Federal Government’s dealings with the State during the reign of the previous Chief Ministers shows numerous subtle interferences in Sabah’s political and administrative affairs by Kuala Lumpur, some of which are manifested in the form of administrative measures and decision making by Federal agencies. As a consequence, many constitutional amendments made at the State level which led to the dilution and surrender of several safeguards, were initiated and influenced by Federal Government. (e.g. Federalisation of Labuan). 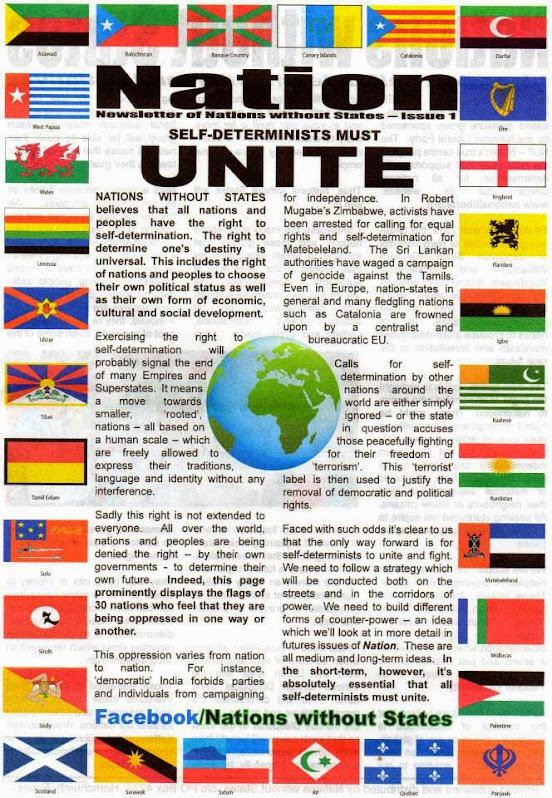 (c) English should be the official language of North Borneo, for all purposes, State or Federal, without limitation of time. (a) Many civil servants who were schooled in English are now employed as temporary or contract officers because of their inability to pass the Bahasa Malaysia examination. (b) The change in the medium of instruction in schools affected the standard of teaching due to lack of qualified Bahasa Malaysia teachers. (c) The teaching of other native languages has been relegated to the background. 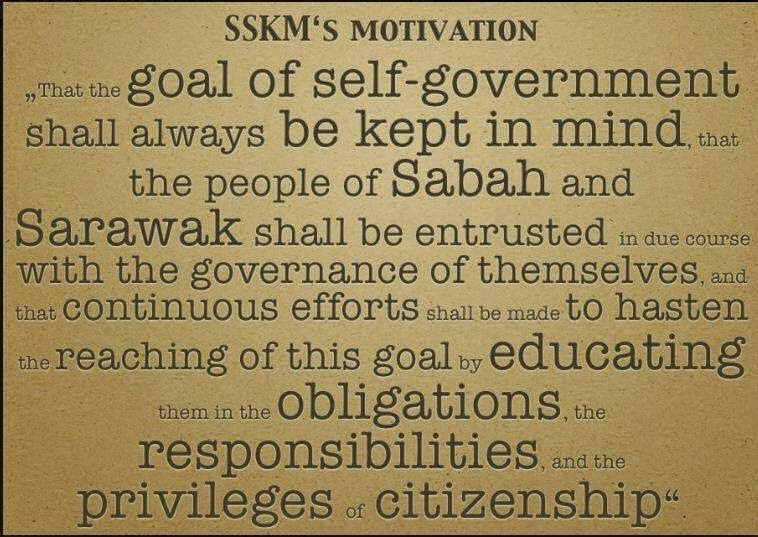 Many Sabahans believe that the Constitutional Bill passed in 1973 to erode this safeguard was probably made on the advise and influence of syed Kechik, who was regarded as the KL’s man in Sabah. (See Ross-Larson(1980)). 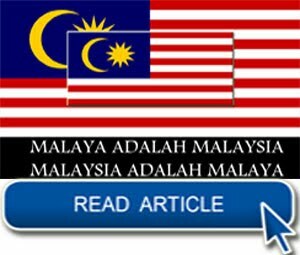 Whilst accepting that the present Constitution of the Federation of Malaya should form the basis of the Constitution of Malaysia, the Constitution of Malaysia should be a completely new document drafted and agreed in the light of free association of States and should not be a series of amendments to a Constitution drafted and agreed by different States in totally different circumstances. 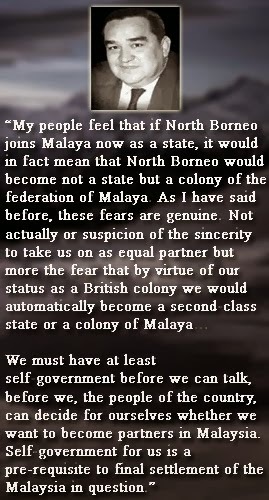 A new Constitution for North Borneo was, of course, essential. (a) Due to time constraint. The drafting of a completely new Constitution would take a long time to complete. (b) The Sabah negotiating team recognised the amount of time and energy required to draft a new Constitution. From the foregoing, it is clear that during the negotiation, the State leaders had shown complete trust and confidence in the capabilities of the Malayan leadership in honouring the assurances and promises given them. As a result, minimum fuss was made of the necessity of casting those promises and assurances in enforceable terms to be duly incorporated into official documents, complete with legal and constitutional recourse in the event of breaches. 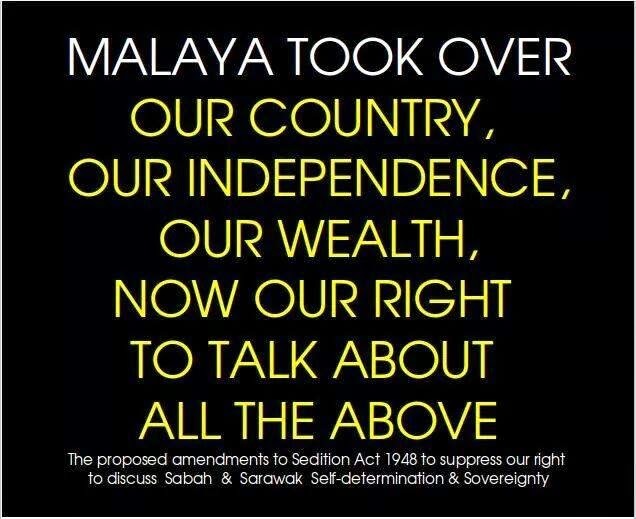 Furthermore, the readiness with which the State leaders consented to the use of Federal Constitution of Malaya as a basis on which new amendments were to be incorporated also illustrates the trusting nature of the State leaders then. 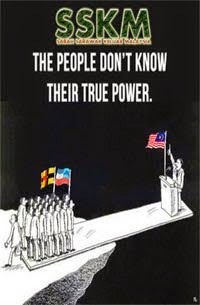 However, the speed with which the formation of the Federation of Malaysia was hurriedly implemented, at a time when the people of Sabah were still constitutionally backward, leaves many present-day better educated Sabahans to question the extent of participation of the Sabahan leaders in the entire negotiation process. For such an important undertaking which affects the future of the people of Sabah, certainly more time should been given. 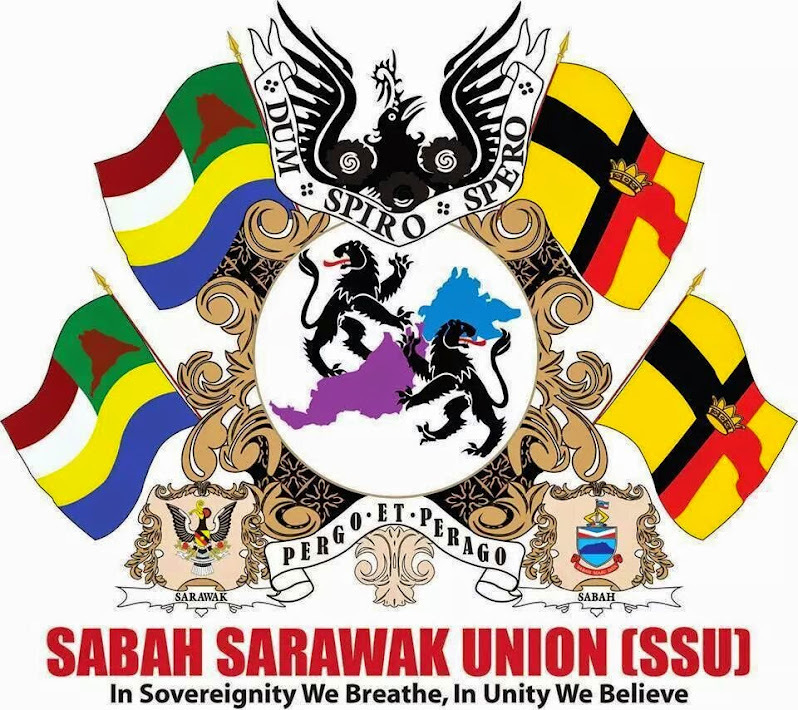 An important agreement reached by the Inter-Governmental Committee was that in certain aspects, the requirement of Sabah and Sarawak could appropriately be met by undertaking or assurances to be given by the government of the Federation of Malaya rather than by constitutional provision. Still, this was a clear deviation from what was requested in the Twenty Points. The Head of State in North Borneo should not be eligible for election as Head of the Federation. Since only a Ruler is eligible to be elected as the Head of the Federation in the Malayan Constitution, there was no necessity to make specific provision for the exclusion of the Head of the State of Sabah from election as Head of the Federation. This point was incorporated into the IGC Report and subsequently into the Federal Constitution. Control over immigration into any part of Malaysia from outside should rest with the Federal government but entry into North Borneo should also require the approval of the State government. 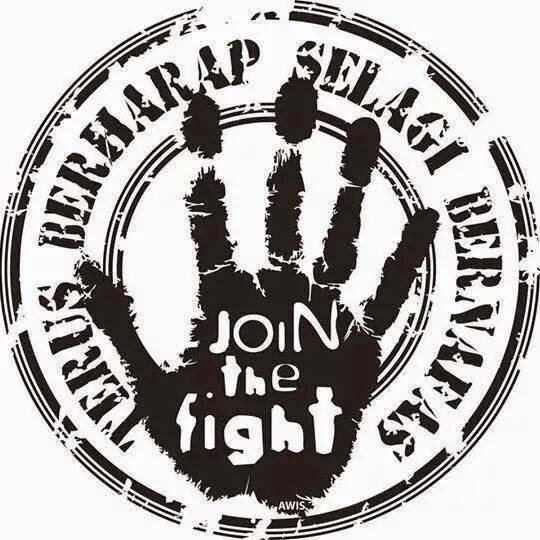 The Federal government should not be able to veto the entry of persons into North Borneo for State government purposes except on strictly security grounds. North Borneo should have unfettered control over the movement of persons, other than those in Federal government employ, from other parts of Malaysia into North Borneo. While it was agreed in the IGC Report that the Immigration department should be a Federal department, the State should have absolute control of immigration to Sabah from within Malaysia. 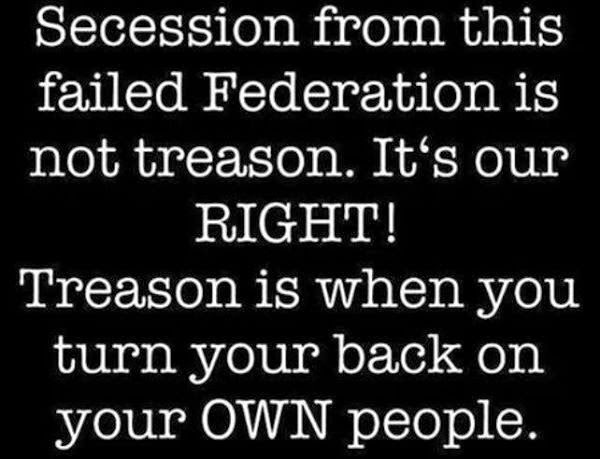 There should be no right to secede from the Federation. There was absolutely no reason or need for this point to be listed since it is not a safeguard for the State but for the Federal government. Nevertheless, the amazing readiness of the five political parties to include this as one of the Twenty Points reflected their firm belief that the ‘marriage’ would be a permanent one. Their decision to concede the right to secession was no doubt motivated by the promise of improved economic well-being that the new Federation would bring and the respect with which the Federal government would place on agreed safeguards and assurances. Borneonisation (Sabahanisation) of the public services should proceed as quickly as possible. An examination of existing records shows that the number of federalised departments or agencies in Sabah has increased 4 times since Independence. By 1985 there were 62 Federal departments and agencies in Sabah, of which more than 90 per cent is currently headed by Semenanjung officers. According to employment record, there are more than 21,000 Semenanjung officers working in government offices in Sabah. This is a clear deviation of the Twenty Points and IGC safeguards. The usual justification used by the Federal Government to engage officers from Semenanjung to fill the federalised government positions is the lack of qualified Sabahans. However, it is found that even officers in the C and D categories are still being imported into the State from Kuala Lumpur. Furthermore, there has been no conscious plan to train prospective Sabahans to take over senior posts from these Semananjung officers. 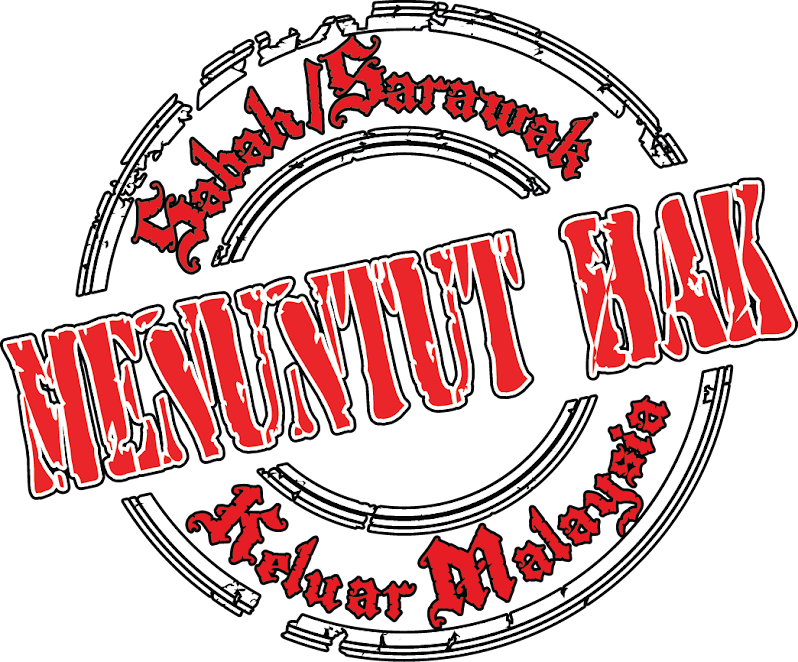 At a time when some 800 graduates and thousands of school leavers in Sabah are unemployed, the existence of a large number of civil servants from Semenanjung serving in government departments gives many Sabahans the feeling that they have been deprived of employment opportunities which, in the context of the Twenty Points, are rightfully theirs. 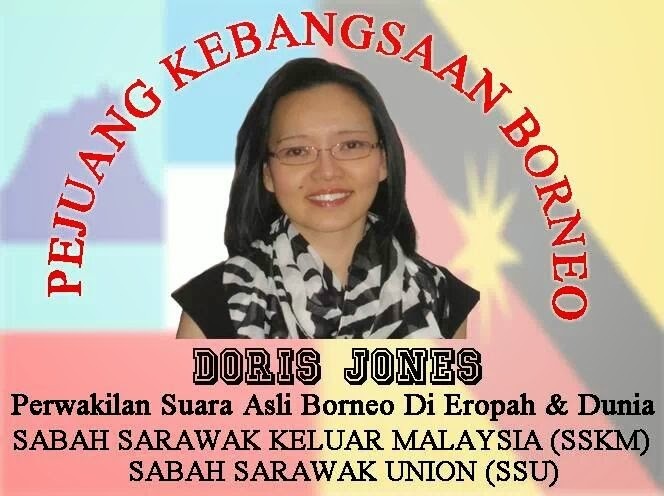 Every effort should be made to encourage British Officers to remain in the public services until their places can be taken by suitably qualified people from North Borneo. This point was taken up and discussed extensively in the IGC Report. (c) Subparagraph (III) should not contain any restriction tied to the citizenship of parents – a person born in North Borneo after Malaysia must be a Federal Citizen. It is public knowledge that there is a significant number of Sabahans who were born before Malaysia Day is still having problems acquiring citizenship. Furthermore, many natives in the interior regions of the State are still holder of red I.C. because of the problems of verifying their birth. It is also common knowledge that certain categories of refugees and illegal immigrants in Sabah have been issued with blue I.C. thus conferring upon them citizenship status and enabling them to vote in elections. This occurred particularly during the tenure of the previous State governments. A reliable source indicates that some 198,000 of these refugees have been issued with blue I.C. According to a newspaper report, which was subsequently confirmed, police forces acting on public complaint raided Peting Bin Ali’s house in Sandakan on 16 November, 1979 and discovered that he was in possession of facilities to issue blue ICs. It is believed that the operators were collaborating with certain registration personnel in Kuala Lumpur. Most surprisingly the culprit was not prosecuted for committing such a grave crime against all the citizens of the country. 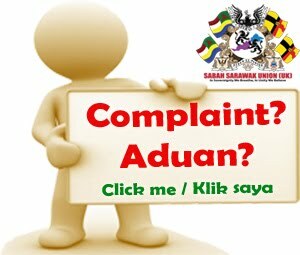 The process by which these illegals are registered by the Federal agencies for subsequent issuance of blue ICs, without due reference to the State, is considered by Sabahans as usurpation of the State’s immigration authority. This is a clear deviation from the safeguard on immigration and control of its franchise rights. Furthermore, the use of Labuan as an entry point to Sabah without immigration check, effectively removes immigration control from the State government. North Borneo should have control of its own finance, development funds and tariffs. 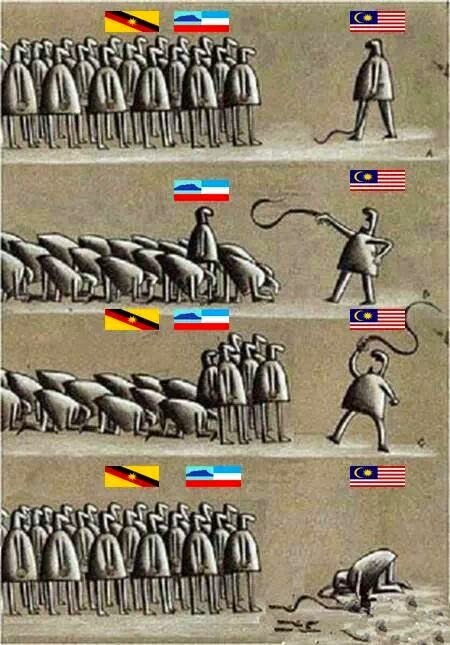 This illustrates the true feeling of the Sabah leaders concerning Malaysia. They saw Sabah as equal partner in Malaysia. With its vast natural resources not yet fully tapped and the promise of rich oil discoveries, the Sabah leaders foresaw that the State would have adequate financial resources to cater for its socio-economic development. Today, all proceeds of revenue other than those listed in Part III of the Ten Schedule are accrued to the Federal government. These include personal income tax, corporate tax, export and import duties, petroleum royalty, etc. The State government derives its incomes primarily from timber exploitation, copper mining, and since 1974, from the 5.0% petroleum royalty accorded to it. 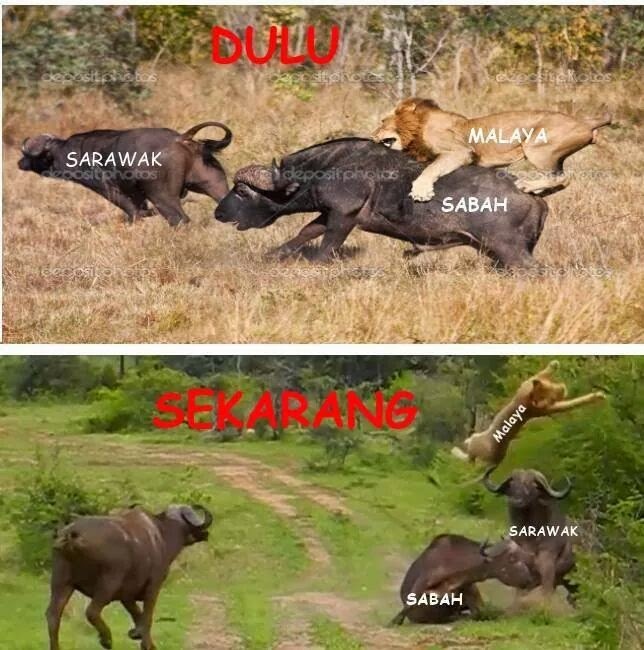 The substantial net outflow of funds from Sabah to Kuala Lumpur is perceived by Sabahans as siphoning off of Sabah’s development funds which is tantamount to financial exploitation of the State. The understanding of the leaders in joining Malaysia was to achieve an accelerated pace of economic development. However, it appears that the bulk of the Federal funds currently spent in Sabah are for operating expenditures rather than for development purposes. The overall level of financial allocation to Sabah by the Federal government can be considered as minimal relative to its socio-economic development needs. These allocations are indeed meagre when compared with the amount of financial resources derived by the Federal government from the State as shown by the table above. It is further felt that the State’s share of its oil revenue (5%) is too small. 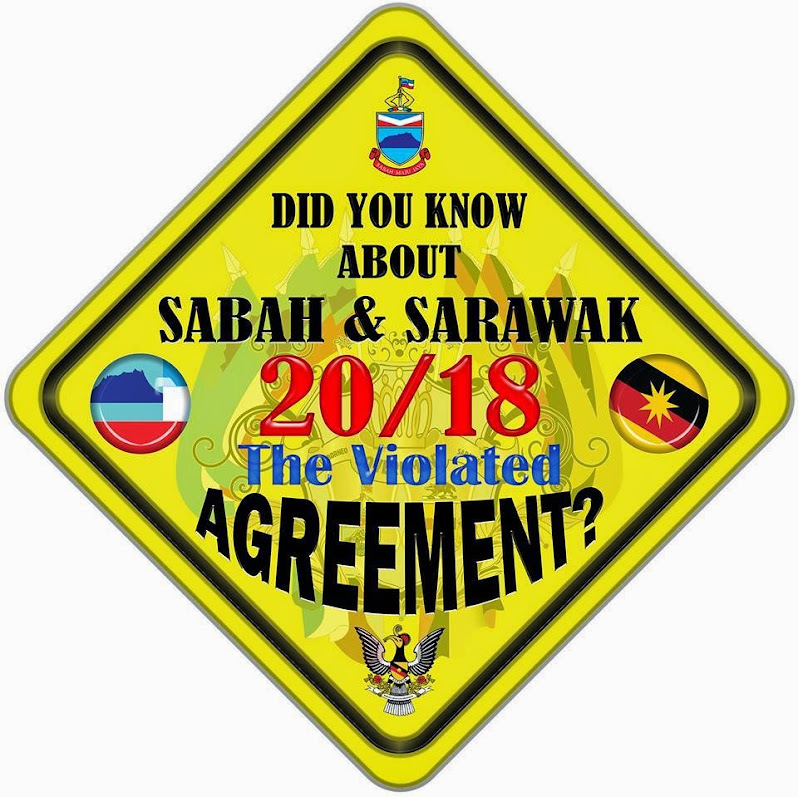 The sequence of events which led Sabah to sign away its oil rights to the Federal government has continued to puzzle the minds of the Sabahans. Previous Chief Minister, Tun Mustapha and Tun Stephens had consistently refused to sign the Petroleum Sharing Agreement indicating their unwillingness to give up the State’s oil rights. It is interesting to note, however, that in the ensuing political crisis following immediately after the June 6, 1976 plane crash resulting in the death of most of the key BERJAYA leaders, Datuk Harris Salleh dramatically reversed the position of the State government by signing away the State’s oil rights. 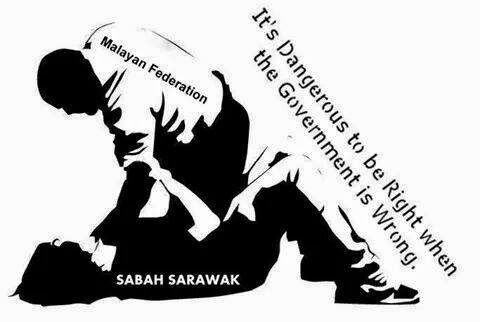 To many Sabahans the signing away of Sabah’s oil rights is equivalent to Constitutional amendment. Many believe that unless approved by the State Assembly with a two-third majority, the Chief Minister’s signature alone does not constitute approval of the people of Sabah. In principle, the indigenous races of North Borneo should enjoy special rights analogous to those enjoyed by Malay in Malaya, but the present Malaya formula in this regard is not necessarily applicable in North Borneo. While in principle the special privileges of Sabahan natives are recognised legally, the implementation of the policy has been somewhat dubious. For instance, when job vacancies in Semenanjung are advertised in national newspapers to the effect that “preference shall be given to bumiputera”, what it in effect implies is bumiputera of Malay origin and, inevitably the Malay in Semenanjung. 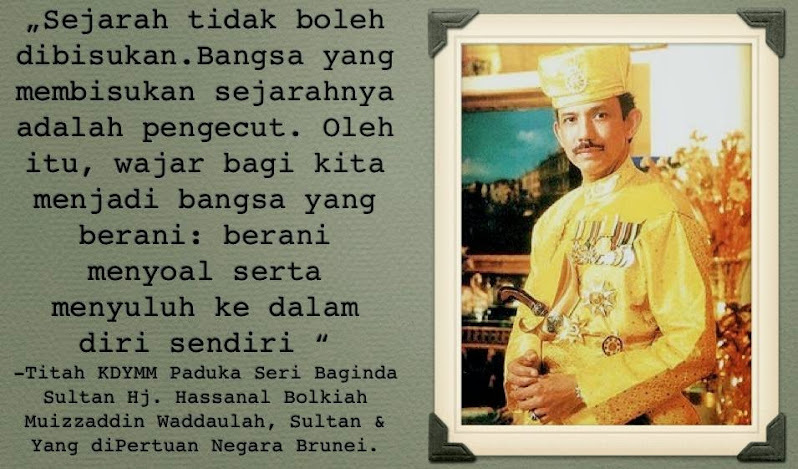 This legacy was exported to Sabah during the reign of the government of Tun Mustapha and Datuk Harris. It is well-known that during those periods, the treatment accorded to indigenous people in the State depended on their religious faith. This gave rise to two categories of indigenous people – Muslim indigenous and non-Muslim indigenous. These actions always done in the name of ‘integration’ with the aim of presenting Kuala Lumpur the impression that the Muslim population in the State had grown rapidly. There were numerous cases during the reign of the previous governments where non-Muslim bumiputeras especially the Kadazans and Muruts, were bypassed for promotion or recruitment into the civil service unless they became Muslim. (b) There should be a proper Ministerial system in North Borneo. The incorporation of this point in the IGC Report and Federal Constitution was consistent with the original intentions of the Sabah leaders. This should be seven years and during such period legislative power must be left with the state of North Borneo by the Constitution and not merely delegated to the State government by the Federal government. 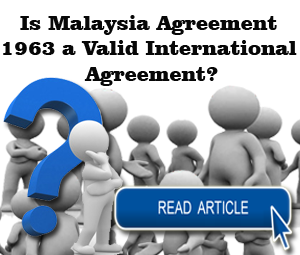 This point was not addressed in the Malaysia Agreement nor dealt with in the Federal Constitution, even though the Cobbold Commission studied the point and recommended that the transitional period should be five years, or alternatively, minimum three years and maximum seven years. The ‘Transitional Period’ is actually discussed in Para 34 of the IGC Report and partly in Annex A to the Report. It was clear that the purpose of introducing the transitional period was to provide the much needed time for the growth of political consciousness among the people of Sabah so that they would be able to understand their roles and responsibilities as political leaders. Both Malaya and Singapore had experienced a period of self-rule before Independence. 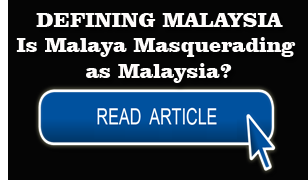 Since neither Sabah nor Sarawak had any form of political relationship with Malaya and Singapore before the formation of Malaysia, a trial period would have significantly improved the Federal-State relationship right from the beginning. Had the transitional period been effected, it is generally believed that the erosion of constitutional safeguards may not have occurred so easily and rapidly. The existing educational system of North Borneo should be maintained and for this reason it should be under State Control. The existing educational system referred to primary and secondary schools and teachers training colleges, but not university and post-graduate education. The Sabah delegation wanted to teach English at all levels of schools in the State as the medium of instruction. Malay and other vernacular languages, such as Kadazan and Chinese, were also to be taught and used as the media of instruction in lower level primary schools in some primary schools in some voluntary agency schools. It was the intention that the education policy and its development will be subject to constant adaption and would move towards a national concept but it should not merely be an extension of existing Federal policy. In the IGC Report education was a federal subject although specific conditions were spelt out for its administration. The IGC Report also specified important conditions pertaining to education development in general including the use of English and implementation of indigenous education. In 1965, the Sabah Education Ordinance No.9 of 1961 was declared a federal law. 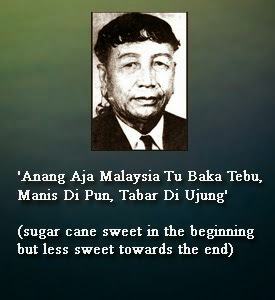 During Tun Mustapha’s reign, the State Constitution was amended to make way for the use of Malay as the sole official language by 1973. When the Peninsular introduced Malay as the medium of instruction in Primary One in 1970, Tun Mustapha’s Administration adopted the same policy in Sabah. Since the Education Act, 1961, was extended to Sabah only in 1976, the introduction of the national Educational Policy to Sabah in late 60s and early 70s with the tacit consent of the then State government under Tun Mustapha was carried out without the proper legal authorities. However, this has been rectified by the extension of the Education Act, 1961. It is also important to note that the IGC Report made specific references to the responsibilities of the Federal government in developing educational infrastructure in Malaysia, “the requirement of the Borneo States should be given special consideration and the desirability of locating some of the institutions in the Borneo States should be borne in mind.” By and large, the Federal government has done little for Sabah in the development of higher education facilities, aside from the setting up of a YS-ITM campus and a makeshift UKM branch campus. Even a donation by the State government of 364 hectares of land in 1980 to be developed into a permanent campus of the UKM together with a $5.0 million contribution from Yayasan Sabah failed to elicit the “special consideration” responsibility of the Federal government on the development of education infrastructure in Sabah as contained in the IGC Report. Yet in Kedah, Universiti Utara Malaysia which was only established in 1984 enjoys the full financing and other support of the Federal government as compared to the Sabah branch of UKM which was established in 1974, or then years earlier. Such a phenomenon does not only violate the “special consideration” clause supposedly accorded to Sabah but it also speaks of the inequity in the distribution of funds for educational purposes among components parts of the Federation of Malaysia. 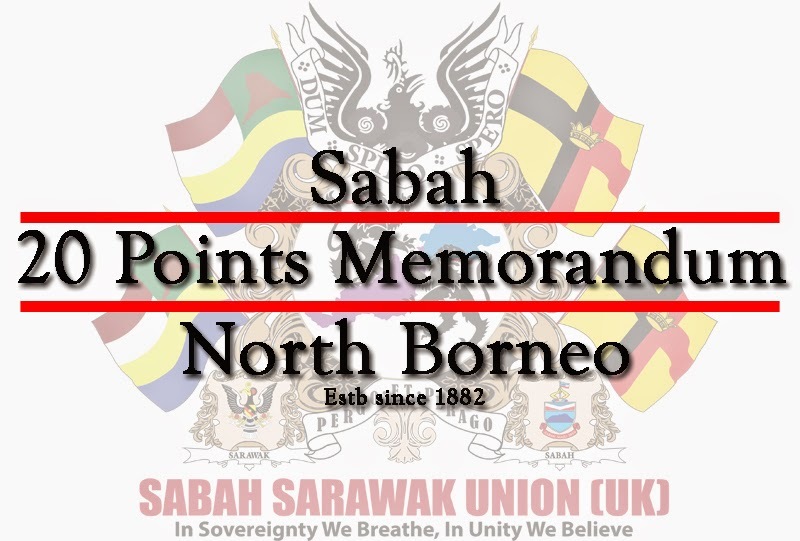 No amendment, modification or withdrawal of any special safeguard granted to North Borneo should be made by the Central government without the positive concurrence of the government of the State of North Borneo. The power of amending the Constitution of the State of North Borneo should belong exclusively to the people in the State. Most of the safeguards contained in the IGC Report were incorporated into the Malaysia Agreement and subsequently into the Federal Constitution, although a number of these have since been repealed. 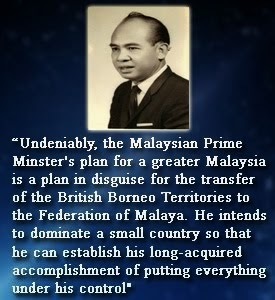 In addition to the provision in the Constitution, Article VIII of the Malaysia Agreement provides that the governments of the Federation of Malaya, North Borneo and Sarawak will take such legislative, executive or other action as may be required to implement the assurances, undertakings and recommendations contained in Chapter 3 of, and Annexes A and B to, the Report of the IGC signed on 27th February, 1963, in so far as they are not implemented by expressed provision of the Constitution of Malaysia. An additional important agreement reached by the IGC was that certain aspects of the requirements of Sabah could appropriately be met by undertakings or assurances to be given by the government of the Federation of Malaya rather than by Constitutional provision. The Committee further agreed that these undertakings and assurances could be included in formal agreement or could be dealt with in exchanges of letters between the governments concerned. 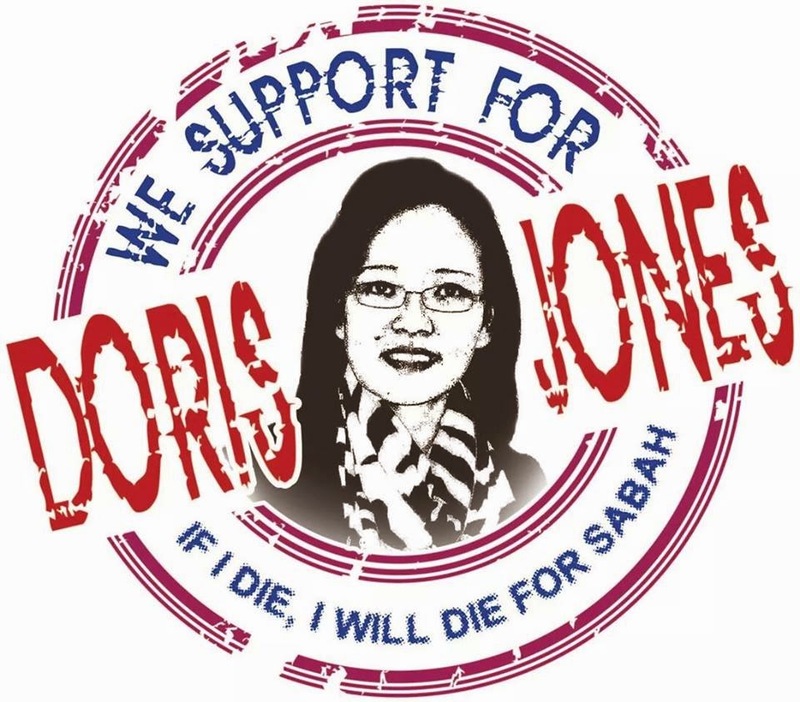 In the minds of the people of Sabah (and Sarawak), the inclusion of the safeguards in the Constitution was reassuring in that they were as good as guaranteed by the British government. There is, however, an oversight by those responsible for drafting the Constitution to ensure that these safeguards are to be really effective. An amendment to the Federal Constitution must be passed by a two-third majority by the Parliament (which in today’s composition of Parliament is a non-issue) and, where State rights are involved, it must have the consent of the State government concerned (i.e. the Executive). It does not have to be approved by the State Assembly (the representatives of the people of the State) by also a two-third majority. Under the present Constitutional arrangements, the safeguards are therefore as good only as the strength or personality of the State government of the day. In essence, most of the safeguards can be abrogated by the mere ‘consent’ of the State government of the day, even for the sake of wanting to ‘please’ the Federal government. 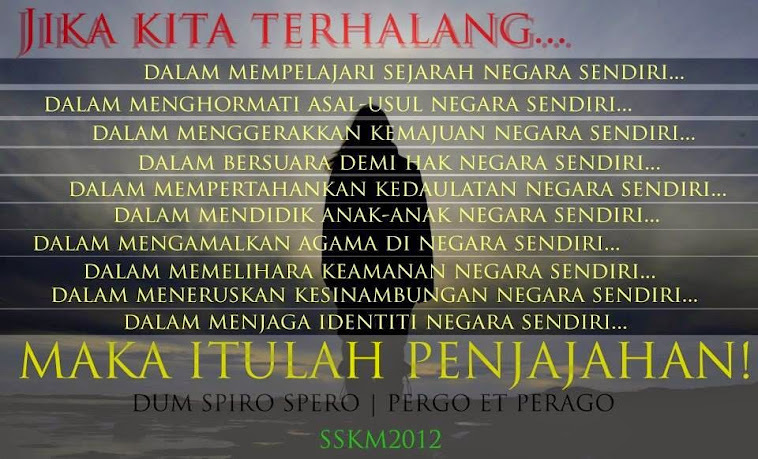 There is a general belief that this had been the case for previous governments in Sabah. Para 30 of the IGC Report and Article 161E of the Federal Constitution provide the constitutional safeguards on some specific matters. While, Article 161E is not exhaustive, these are safeguards found in other constitutional provisions. Amendment to Article 3(3) (making the Yang Di-Pertuan Agong the Head of Islamic religion in Sabah) and repealed og Article 161A(1)(2)&(3) (relating to the special position of the Natives of Sabah) and Article 161D (relating to freedom of religion in the State) if made without the concurrence of the Yang Di-Pertuan Negeri contravenes Article 161E. It should be pointed out that there are also cases where the Federal government failed to seek the concurrence of the State government in making amendments relating to matters under State control. Similarly, when the Federal government put fishery matters as a supplement to the Concurrent List taken away from the State in 1976, concurrence was not sought from the State government. And when the Federal government repealed the Fishery Ordinance in 1978, again the State government was ignored. The Fisheries Department in Sabah is now in danger of being sued by the public because it is enforcing law upon which it has no power to it. This should take account not only of the population of North Borneo but also of its size and potentialities and in any case should not be less than that of Singapore. This point was taken up in the IGC Report and Malaysia Agreement. However, it is important to stress the fact that when considering representation in the Federal Parliament, the potentialities of Sabah should be taken into account and that the mention of the size of Singapore’s representation was only the minimum requirement. There are now 20 members from Sabah in the lower house of the Parliament. This particular point therefore remains ‘unbroken’. 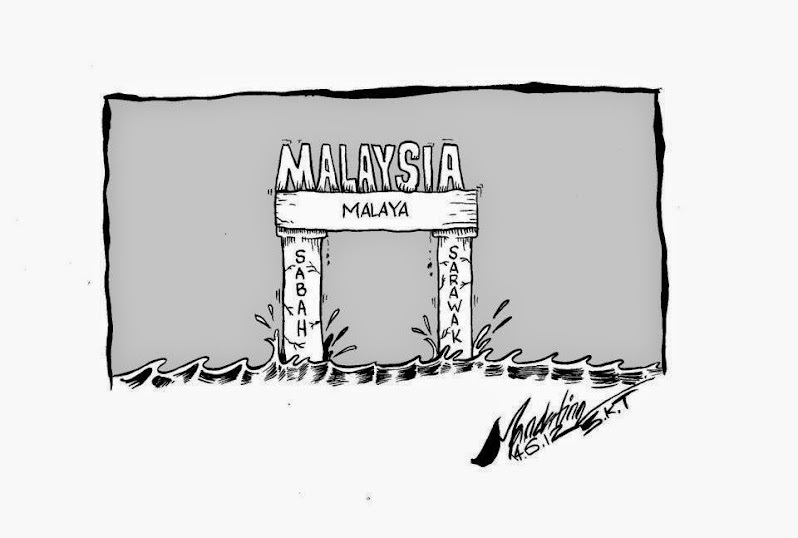 But since the signatories of the Malaysia Agreement consisted of the four governments of Malaya, Singapore, Sarawak and Sabah, there is a strong case for arguing that the matter should have been reviewed when Singapore pulled out from the Federation of Malaysia. Indeed in view of Singapore’s departure from the Federation this safeguards must be reviewed along with other assurances in order to give the Malaysia Agreement validity. This review should be made immediately if Malaysia, as a federation, is to continue to be valid. The name of the Head of State is Yang DiPertuan Negeri, as opposed to Yang DiPertua Negara as contained in both the Twenty Points and IGC Report. 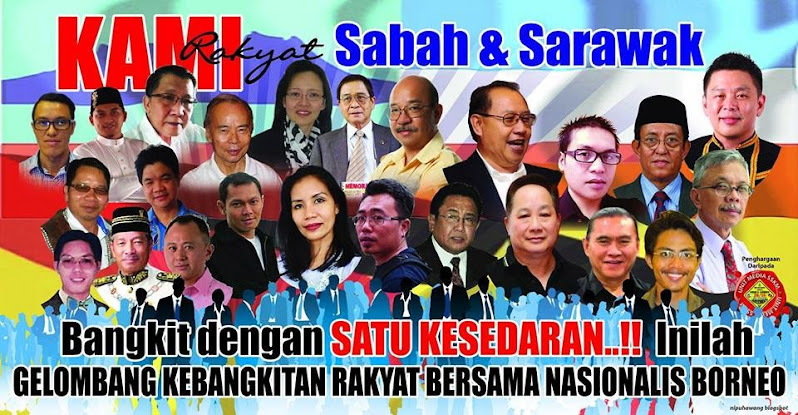 The use of the word ‘Negara’ by the Sabah leaders seems to convey the point that in their minds, independence was to bring with it a certain level of political autonomy for Sabah. 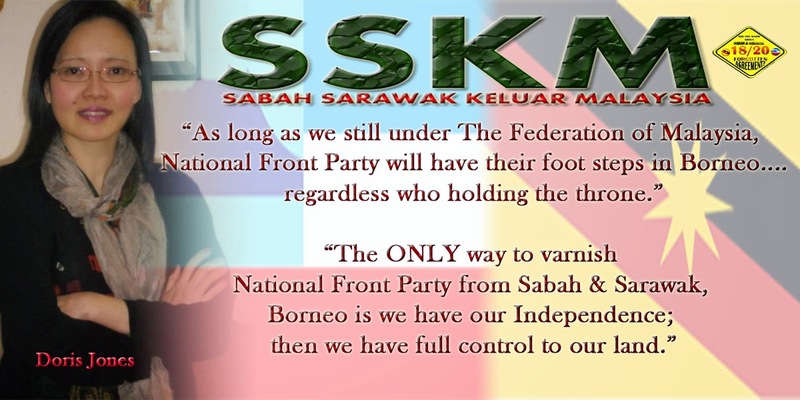 It may therefore be argued that Sabah upon joining the Federation was a ‘negara’ or a nation. This clause was amended in 1976 in the Federal Constitution. Hence, the fact that this provision is not followed is a clear deviation. This point was taken up in both the IGC Report and Malaysia Agreement. Point 20: Land, Forest, Local Government etc. The provision in the Constitution of the Federation in respect of the power of the National Land Council should not apply in North Borneo. Likewise the National Council for Local Government should not apply in North Borneo. While the State continue to exercise control over land, agriculture and forestry, the Federal government has established a National Land Council whose intention is yet to be determined. Should the National Land Council extend its jurisdiction over Sabah then it will contravene this particular provision. In conclusion, it is shown that there are a number of critical areas in which the Federal government has deviated from the original spirit and meaning of the constitutional safeguards and assurances granted to Sabah at the formation of Malaysia. The basic conditions were contained in the memorandum called the “Twenty Points”, the contents of which were subsequently incorporated into the IGC Report, the Malaysia Agreement and Federal Constitution. The principle areas in which there have been clear deviations with respect to implementation are those which relate to matters pertaining to Immigration, Religious freedom, Borneonisation, Citizenship, Education, Finance, and Tariff Arrangements and Constitutional safeguards. Deviations in implementation with respect to these matters have been largely responsible for strained Federal-State relations, thereby presenting barriers for territorial integration. It must nevertheless be stressed that problems pertaining to Federal-State relations do not originate merely from deviations as described above. 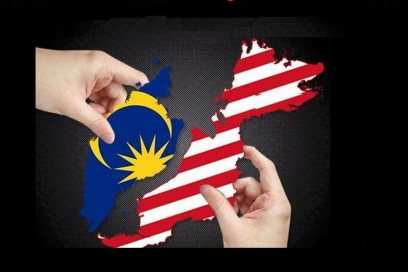 Equally important is the problem of political interference by Kuala Lumpur in State affairs. 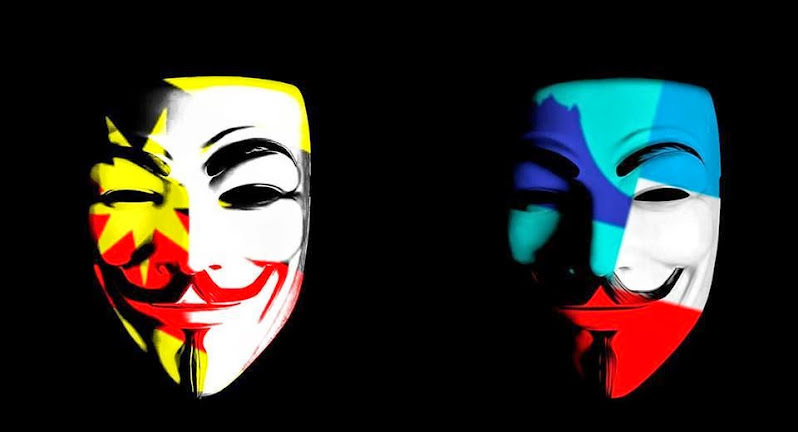 As a result of the deviations and political interferences, an idea is now slowly taking root that there is going to be a ‘take-over’ of the Borneo Territories by Malaya and the submersion of the individualities of Sabah and Sarawak. 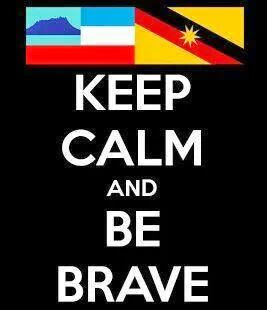 How to deal with Sarawak and Sabah?